Ending a busy day of work, tired to backing home, do you want to feel the feeling of relaxing and sleeping on the clouds? Follow me to learn about this luxury never go flat pillow! 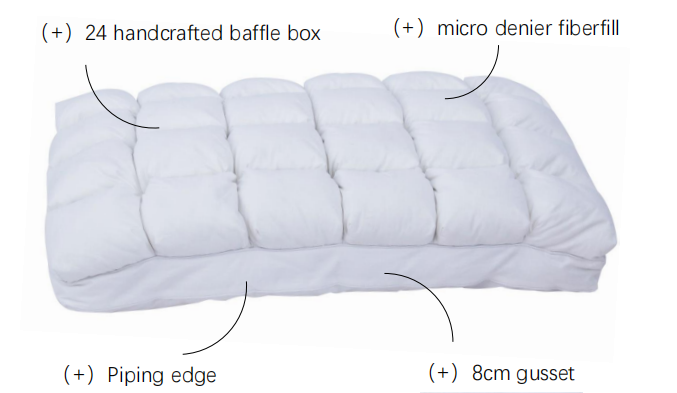 Featuring with handcrafted high loft baffle boxes, the pillow filled with slumber soft micro denier fiberfill. The base layer, with gusset design, enhance the supportive for the pillow. 1 side features 24 unique smaller pockets filled with dowm like microfiber, to give your head the comfort and support for the perfect night’s sleep. 2. The microfiber fill is low allergenic and odourless which is ideal for people with allergies. 3. Comfort technology with dual support levels. Believe me, bring this pillow home, you will have a different sleep experience than ever before! This entry was posted in Spring Share and tagged luxury pillow supplier, pillow manufacture, pillow supplier, supporting pillow factory by admin. Bookmark the permalink.